Sorry if this has been asked before, I couldn't find a thread. 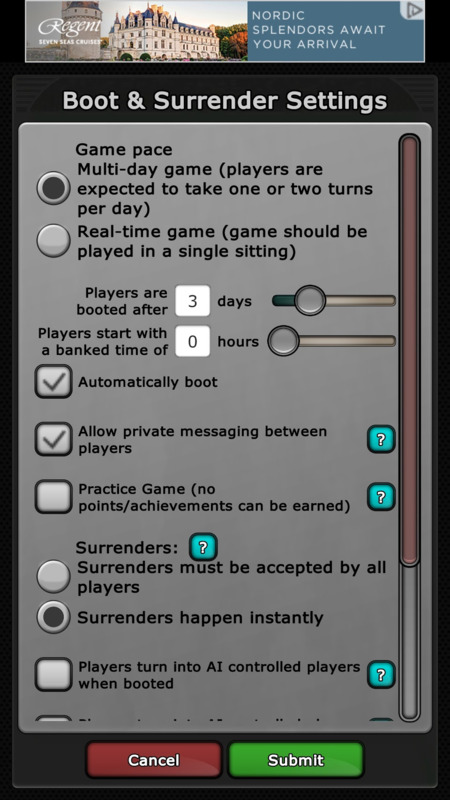 I'm very confused because the wiki ( https://www.warzone.com/wiki/Banking_boot_times#Settings ) says there are three settings for banking time, but when I create a game I only see "Players start with a banked time of [0 hours]". I don't see anything for "Bank Percent" or "Bank Duration". No wonder you are confused, since banking settings are different in old flash and new unity client. This page was last modified on 28 August 2014, at 18:42. Slightly out of date this wiki page. Thank you so much! I was tearing my hair out.